Know Theatre of Cincinnati prides itself on innovative concepts. 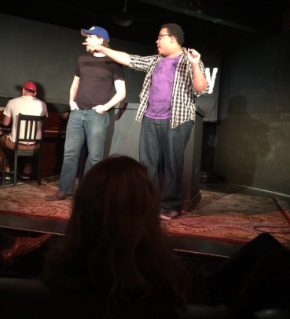 The Cincinnati Fringe Festival is an extension of their theatre and they partner with others like OTRimprov, Unity Productions, and TrueTheatre to find ways to support creativity in theatrical arts. SERIALS is a unique concept to the region in which plays are presented episodically over several weeks. The first installment was a creative success with one of them being produced as later as a full-length production (SATURDAY THE 14TH) and one as a feature film (THE FUNERAL). The second installment featured a competition element, which was controversial and I personally didn’t like the results – kicking some interesting, thoughtful, and well written pieces out of production in favor of un-rehearsed, read-from-the-script shows as well as some poorly conceived pieces. But majority rules – or popularity, at least, when done this way. However, SERIALS 3 has been promised for the summer and I’m excited to see which of the potential styles will rule the day. There are a few options on the ballot – “Classic,” which I’d be fine with. “THUNDER DOME” again, which I’d rather not see. There’s “LIGHTNING ROUND” in which a group of playwrights is selected and their work either survives or dies week to week – and if it dies, then they must come up with a new concept for the next episode. There’s another one in which the audience will vote sudden death style immediately following the performance. And there’s my favorite, “Roundhouse” in which the playwrights will rotate through each other’s plays as the week’s progress. We’ll see what the audience selects soon (I hope). As far as my thoughts on SERIALS 2, I enjoyed the writing of ANDY’S HOUSE OF, the performance of Dylan Shelton in CINDERBLOCK, the quirkiness of Andy Simpson in A ROLLING STONE GATHERS NO LOSS, Jon Kovach’s hilarious foray into crude humor in BARREL OF MONKEYS, Becca Howell’s interesting fresh take on fairy tale princesses called HAPPILY, and everything about SO IN TENTS by John Bromels. If I had to pick a “winner,” it’d be this piece as it was well acted, well written, well presented, and popular. I’ll be back for what I consider to be the best theatre party in town when SERIALS 3 reconvenes. You should totally get a season pass and join me at Know Theatre when it starts this summer.